The year was 2006. Social networking service Twitter was introduced to the world, and Google bought YouTube, the video sharing website. It was also the year that Alabama Launchpad started as a three-year pilot. Alabama Launchpad, a program of the Economic Development Partnership of Alabama, is very different today than what its founding board imagined. Today, the board looks back on a decade of steady growth and looks forward to opportunities to accelerate growth and expand partnerships – all with the end goal of helping companies start, stay and grow in Alabama. How many companies has Launchpad launched? Well, in the pilot years, we launched three per year. This grew to 10 per year in 2013 and 2014, and that number increased to 15 per year in 2015. With the steady growth of launching early stage companies, not all survived. At the end of 2015, Alabama Launchpad had funded a total of 51 companies, and we report 36. Some of the companies were acquired, and some did not make it. Even with the loss of some startups, particularly some from the early years when processes were different, the net growth of jobs created and capital raised is positive. Year over year, trend lines project accelerated growth as the program matures and investments increase. Even when job losses are subtracted, Launchpad shows net increases in job growth every year. In 2015, Launchpad grew 60 more jobs than in 2014. And Launchpad companies have leveraged the $2.36 million invested in startups by a 10x leverage, with $24 million capital raised by Launchpad alumni. And this number does not count the milestone of $10 million in revenue reached by one Launchpad alumnus company in 2015. The State of Alabama partnered with Alabama Launchpad in 2009, with a $250,000 investment. This grew steadily to $750,000 per year in recent years, and it requires a dollar for dollar match to access the funds. As Launchpad learned more from alumni, it grew programs to complement the startup competition. These include $200,000 in funds to provide commercial viability assessments to university inventors, and $80,000 to $100,000 in funds to launch the Alabama Small Business Innovation Research (SBIR) and the Small Business Technology Transfer (STTR) program to help Alabama companies win and manage SBIR funding. Across Alabama, many resources are needed to grow the base of high-growth opportunity companies. There are still gaps along the capital continuum – human capital talent gaps and financial gaps. As we look forward to a new decade of accelerated growth, an expanding network of entrepreneurs, CEOs, investors, and mentors are so important as we listen, incorporate feedback, and learn together. All hands are needed. Opportunities are abundant to align state and local efforts to reach full potential. 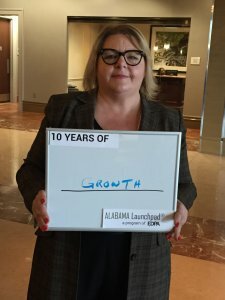 As Alabama Launchpad celebrates 10 years, we look forward to the future, and we believe that the state and local communities need aligned strategies that pursue innovation rigorously, resource it appropriately, measure results, nurture the entrepreneurs, and achieve another decade of greater growth.